This is the perfect book to read around Thanksgiving – when you’re full and happy, and maybe a little nostalgic… or when you’re remembering the dearly departed and hoping new memories fill up the empty spaces. Amish grandparents Anna and Felty use their matchmaking skills – and love! – to bring Cassie together with her meant-to-be. Nevermind that Cassie’s mom wants her to marry an Amish guy. And come back home. And rejoin the church. What?! While Cassie wants to remain in the modern world and find a moral Englischer, she doesn’t fight her family. But while Cassie tries to keep the peace, her soul mate is going through a crisis of faith. 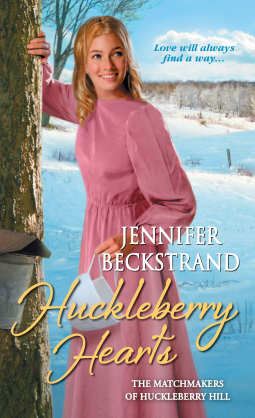 I love all of the Huckleberry Hill books, but I especially appreciated the messages in this one. Beckstrand touches on love, loss, death, staying true to yourself, freedom of religion, and the popular question of why evil exists and why God doesn’t stop it. I stayed up late, I bawled my eyes out, and even though Beckstrand is taking a break from the series, I’ll be stalking her page to see if she changes her mind. Excellent read, with plenty of laughs, some tears at the end, and a whole lot of warm hearts.